An essential element of this activity is its network of offices spread across 12 countries, primarily in Latin America, and manages 4,000 certificates, whilst developing an intense activity in the training field. In each of these markets, AENOR is a benchmark in certification thanks to the recognition of the organisation&apos;s quality seals. AENOR carries out inspections on behalf of private clients, their parent companies and/or public authorities, with the aim of providing information on compliance with legislation, standards, or applicable specifications. Through the inspection service, AENOR ensures that all merchandise that arrives at the destination complies with the required specifications. Since 1992, AENORformación has been promoting techniques for developing management systems in organisations and providing training for technical specialisation and management skills. 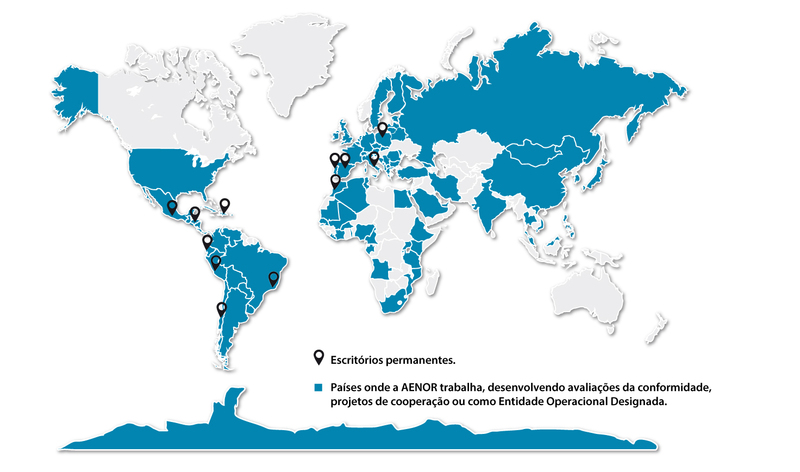 On an international level, in 2016 more than 8000 professionals attended 550 courses (either in-company or in-person) given by AENOR in 18 countries outside Spain. AENOR offers the best catalogue of environmental certificates, validations and verifications, which allow organisations to accredit their commitment to the environment, minimising their impact and helping with the best management of resources. AENOR is the first Spanish organisation to be accredited by the UN as a Designated Operational Entity (DOE) within the Clean Development Mechanism (CDM) of the Kyoto Protocol. It is therefore able to offer, among other things, the validation of CDM projects. AENOR is the Spanish member of IQNet, the largest network of certification organisations in the world, which boosts its capacity to offer services where they are needed, always with the same high quality. In addition, thanks to their inclusion in the IQNet Academy, students on the affiliated courses receive international recognition.